Hello everyone 🙂 It has been overcast, windy and drizzly for what seems an age and so I seem to be in macro mode at the moment. This is an unusual Chrysanthemum flower from a local florist. It has bi-coloured petals (a dark cream and light burgundy colour), light on one side and dark on the other, with a wonderful texture and a beautiful whorl at the centre. Lovely detail. Nicely done in B/W. A whirl of Ivory tusks. Beautiful image. 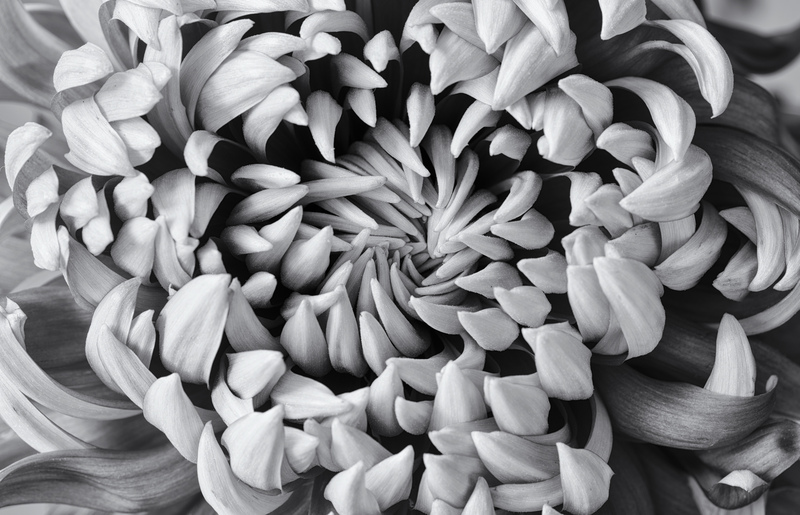 Like the way your bnw shows up a textural pattern, how the petals will open in sequence to reveal the hidden heart. Amazing macro photo, well done!